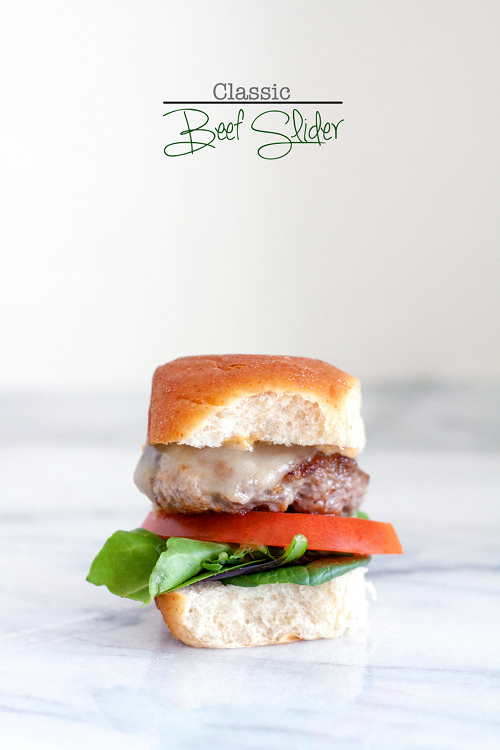 Red Shallot Kitchen: When in doubt….make some beef sliders! When in doubt….make some beef sliders! Inspirations run dry, creativity's stalled, the desire to cook is diminishing. But the day is young, and hungry mouths still need to be fed. Some slider buns, ground beef in the refrigerator, and some vegetables to go along. Beef sliders make tasty compromise for this lazy cook. To make Chipotle Mayo: Place mayonnaise, chipotle pepper, adobo sauce, and lime juice in a food processor. Pulse until smooth, set aside. Preheat the grill to medium-high heat. Combine ground beef, onion powder, garlic, Worcestershire sauce, salt and pepper in a large bowl until well combine. Divide ground beef into 12 equal pieces, form each one into a patty. Place patties on the grill, cook for about 4 minutes on one side, flip them over, and cook for another 3 minutes. Place cheese slices on each patty, continue cooking for about a minute, until the cheese starts to melt. Remove patties from the grill. Arrange beef patty, vegetable and tomato slice on the buns, top with Chipotle mayo and serve warm. Have a good day, Priscilla.